Paul Wolfowitz, Bill Kristol, and Douglas Feith should be ignored: The neocons already destroyed Iraq once. Paul Wolfowitz, Bill Kristol, and their fellow neocons botched Iraq. Now they want to tell you what they think. Ignore them. 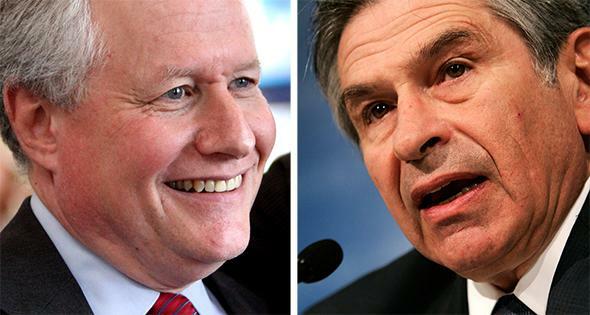 William Kristol, left, and Paul Wolfowitz, right, have no credibility. Composite by Slate. (Left) Photo by Gage Skidmore/Wikimedia Commons. (Right) Photo by Alex Wong/Getty Images. Let’s say you’re an academic-turned-public official who helped push your government into war. You promised an easy victory and an inexpensive reconstruction, financed by the conquered nation’s oil revenue. You built your case on the presence of weapons of mass destruction in the targeted country, and then switched gears—this was a war for “liberation”—when none were found. Within a year of the invasion, it was clear your advocacy was a mistake. The easy occupation never materialized, and America was stuck with an expensive quagmire. The war you helped engineer had become a disaster for everyone involved, with countless deaths and trillions in wasted dollars. Now, more than a decade later, the United States has ended its war and left this country to handle its own affairs. And in short order, it has collapsed into chaos and anarchy, thanks to sectarian leadership and deadly extremists. Given your role in building this catastrophe, you should be barred from public comment, since anything you could say is outweighed by the damage you’ve done. But this assumes a world where elites, like yourself, are accountable for their ideas. Not only are we not in that world, we’re in its opposite, where failed elites are invited to pontificate on their failures, as if they haven’t been already discredited by their performances. Ignore, for a moment, the fact that the circumstances of Iraq are vastly different than those of Cold War Korea. Or that, as my colleague Fred Kaplan notes, “the collapse of Mosul … has little to do with the withdrawal of American troops and everything to do with the political failure of Prime Minister Nouri al-Maliki.” What’s amazing about this is the extent to which Wolfowitz is treated as a serious interlocutor. It’s as if his history never happened, and he were just another pundit with another perspective. More egregious than Wolfowitz on Meet the Press was Bill Kristol on ABC’s This Week, where he also held forth on the violence in Iraq. “It’s a disaster unfortunately made possible, certainly made more likely by our ridiculous and total withdrawal from Iraq in 2011,” said the former Iraq war cheerleader, who famously declared, “American and alliance forces will be welcomed in Baghdad as liberators.” He continued, “President Obama said two days before Election Day, in 2012, al-Qaida is on the path of defeat, the war in Iraq is over. That was enough to get him re-elected, but how does it look today? Al-Qaida is on the path of defeat, the war in Iraq is over. Neither is true. It’s a disaster for our country.” For Kristol the prospect of “defeat” is enough to justify a new presence in Iraq, regardless of the costs to American soldiers and Iraqi civilians. If you want intelligent commentary on this situation—or any other—you’d do well to stay away from anything Kristol says. Remember, this is the same Feith who led the office responsible for postwar planning in Iraq, which—you’ll recall—was a disaster that helped set the stage for the current situation of civil collapse in the country. And in the Wall Street Journal, another failed administrator has called for new involvement. “It is time for both American political parties to cease their ritualistic incantations of ‘no boots on the ground,’ ” wrote Paul Bremer, former head of the Coalition Provisional Authority, who—in 2006—insisted that most of Iraq was at peace. Listening to either for advice on appropriate Iraq policy is like asking Michael Brown, the former head of the Federal Emergency Management Agency, for advice on disaster preparation. And yet, here we are. The simple fact is this: We are a country where poor teenagers are locked up for the slightest transgression, but with vanishingly few exceptions, elites are shielded from the consequences of their actions. If you’re a billionaire who funds calls for aggressive austerity at the expense of ordinary Americans, a banker who helped crash the global economy, or a pundit who pushed the country into a disastrous war, you’ll never be sanctioned. If anything, you’ll be rewarded with audiences to listen to you, firms to hire you, and producers to book you on Sunday morning shows. Neocons deserve one thing: to be ignored.